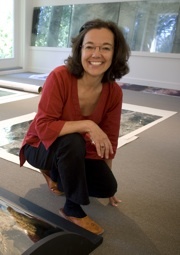 Liz Ingram was born in Argentina and grew up in New Delhi, Mumbai and Toronto. For over thirty five years she has been teaching at the University of Alberta in Edmonton, Canada, and is currently Distinguished University Professor in printmaking and drawing/intermedia. Her art works have been exhibited in over 20 solo and duo exhibitions, and over 250 group exhibitions in North and South America, Europe, the Middle East and the Far East. She has participated in Biennials and Triennials for many years and has received awards for her prints at juried exhibitions in Canada, Slovenia (Yugoslavia), Poland, Korea, Brazil, Estonia, India and Finland. In 2008 Ingram was the recipient of the Gordin J. Kaplan Award for Research Excellence at the University of Alberta, and in 2009 she was elected into the Royal Society of Canada for her contributions to Canadian culture. She has been visiting artist at universities in North America and overseas including the Tokyo National University of Fine Arts and Music, the Musashino Art University in Tokyo and the University of Applied Sciences in Münster, Germany. The human body and the elemental in nature are recurring sources for her art practice which investigates transitional states between material presence and the ephemeral, and issues relating to the fragility of life and the environment. In an attempt to reawaken an understanding of our fundamental connections with nature, she is currently using images of glistening water and the human body. With the aid of the printed image, paper and ink, glass, light, shimmering pixels and fabric, Liz wishes to give the viewer an experience that will tap childhood memories of the sensation of playing in water, and will celebrate the wonder of this endangered and essential substance. Her work represents an attempt to re-awaken our fundamental connections and our oneness with nature, and our awareness of the elemental aspect of water to all life forms. The work is about vulnerability and strength, about a cycle of disappearing and emerging, about uncertainty and wonder. of Site, Gulbenkian Galleries, London, England, and Musashino Museum and Library, Tokyo, Japan, 1999. Printmaking has traditionally been a medium that absorbs new technologies, and distributes image-based content to a broad audience. In our world of image and technology proliferation, a renewed interest in the intimacy and tactile qualities of limited edition artist book-works and the hand-made limited edition paper print is occurring alongside an explosion of exciting image explorations in digital media, print-installation and large print-based public commissions. With increased scale potentials and new material substrates available for printing, more artists with printmaking backgrounds are engaging in large-scale installation works and public commissions, alongside their more traditional printmaking practices. I would like to suggest that print artists are extremely well positioned and have unique opportunities to engage in the competitive world of public commission competitions and interdisciplinary collaborations. Practical knowledge of the fundamentals of traditional printmaking provides artists with invaluable experiences of technical and conceptual methodologies that easily transfer to new technologies, new manufacturing methods, and current social situations. Also the practice of collaboration, so often an integral part of the traditional print studio, is a key component of large-scale interdisciplinary projects. The common practices of the traditional print artist: working alongside fellow artists; sharing ideas and materials; having works printed by others; or printing works for others, help prepare the printmaker for working with architects, manufacturers, engineers, poets and scientists, etc. Alberta is a province in western Canada where - despite its distance from major art centres - a rich and vital printmaking community has developed over 40 years originating in the Universities and Art Colleges. A number of senior artists from Alberta, whose backgrounds and practices are grounded in traditional printmaking, are currently engaging in projects that involve substantial collaboration outside the discipline. This paper will highlight the work of Derek Besant, Sean Caulfield, Alexandra Haeseker, Liz Ingram and Walter Jule.